So, what does this mean? Big Money Republicans have been waltzing in and BUYING OUR ELECTIONS completely unchecked. It&apos;s disgusting, not to mention UNDEMOCRATIC! Now it&apos;s time to act -- but it won&apos;t be easy. Amending the Constitution is a MAJOR undertaking. But we know that grassroots activists -- like YOU -- are fired up and ready to make a change. We need a wave of support from citizens across the country who are ready to get money OUT of politics. 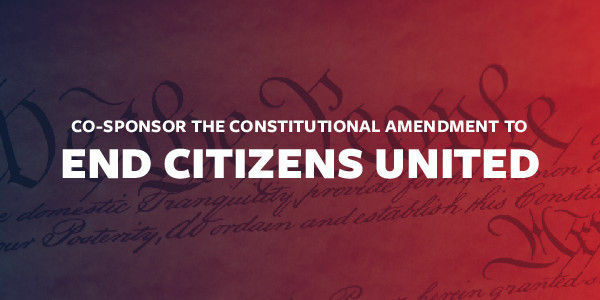 We&apos;re BEGGING: join us NOW and add your name to Citizen Co-Sponsor a Constitutional Amendment to OVERTURN Citizens United.